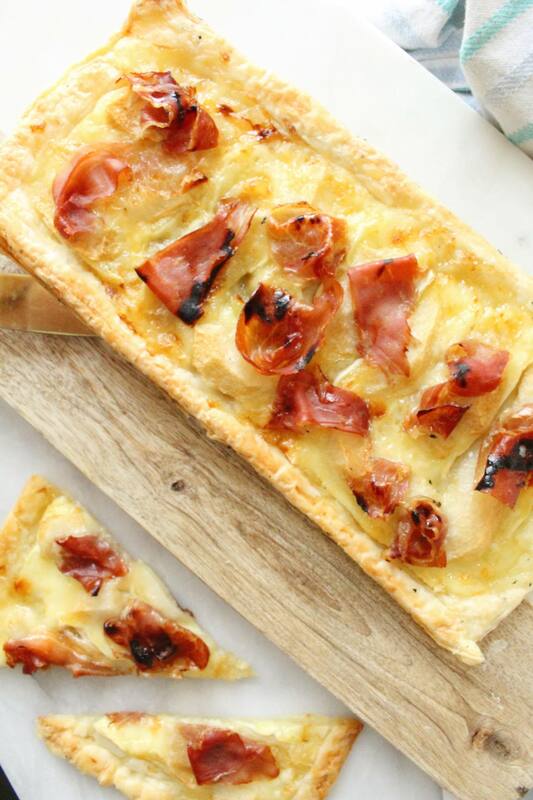 This has to be my favourite ‘Go To’ prosciutto cotto recipe! It’s great for lunch or when you have company over and it always seems to be a hit with everyone. 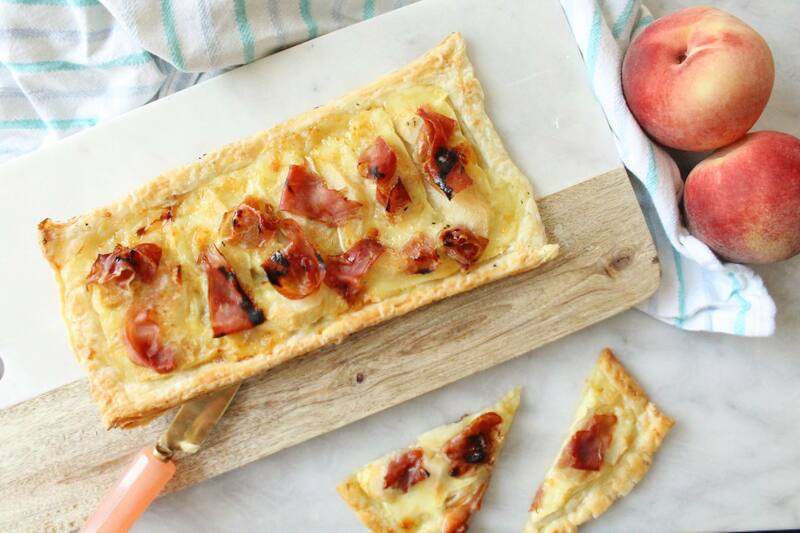 This Tart so easy to make, it’s incredibly tasty and full of flavourful! Mastro has the best Prosciutto Cotto, it’s full-flavoured Italian-style ham, it’s so tasty and extra lean (click HERE for a $1 off coupon!). It’s one of my favourite things to eat, followed by Brie and peaches so it’s no wonder why I enjoy this recipe so much. 2. Roll out the two puff pastry sheets with a rolling pin and score the edges of the pastry 1 cm all around. Place pastries on parchment paper and then place on a baking sheet. 3. Place the Brie slices evenly over the Tart. Next, layer the peach slices over the Brie. 4. Drizzle 1 table spoon of honey over each Tart. 5. 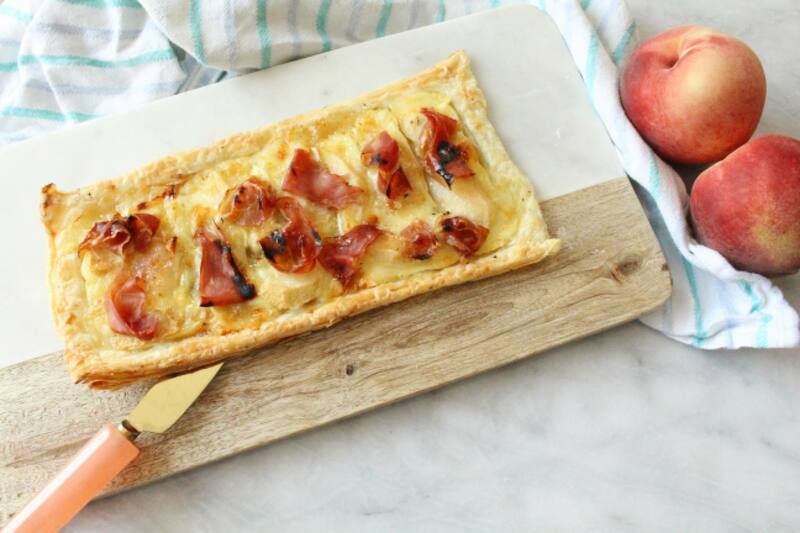 Tear the prosciutto cotto into smaller pieces and place on top of Brie and peaches. Bake in the oven for 10 minutes or until edges of Tart are golden brown. 6. Let cool for three minute, slice and serve! So yummy! If you’d like, you can add half a cup of arugula over top of he tarts once they’ve cooled down. Hope you enjoy this delicious recipe as much as we do! Mastro and I would love to encourage you to get in the kitchen so we’ve teamed up to host a fun giveaway! The prize? A Tote Bag, Cutting Board and 3 x $1 off coupons! 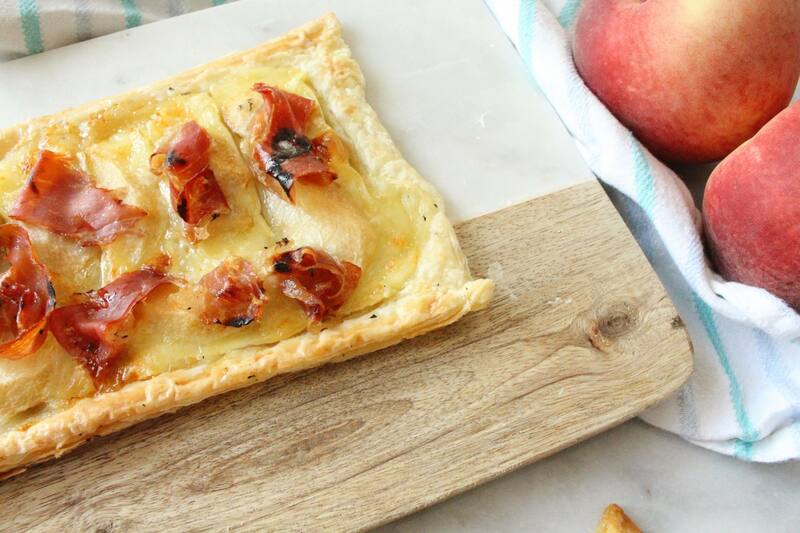 To enter, just let me know in the comments below your favourite prosciutto cotto recipe! Good luck 🙂 Winner announced 09/12/17. Wrap the above ingredients with a strip of prosciutto cotto and pin with a toothpick. Make as many as you can. They’ll go fast! just a plate with prosciutto, some nice bread, cheese, olives and fresh ripe tomatoes. I’ve never actually cooked with Prosciutto before but I’d like to. I browsed some recipes and I think a Tomatoe, Spinach,Mushroom & Prosciutto Cotto Pizza sounds amazing! Would love to try the croissant recipe or melon. Procuitto on pizza is great! prosciutto, swiss cheese and a croissant, heated in the microwave. It’s so good. We like a simple appetizer of mozzarella sticks wrapped in prosciutto with a balsamic glaze. We’ve been known to make pizza using Prosciutto Cotto & rapini! I enjoy Prosciutto cotto on a thin crust pizza. I like my prosciutto with some nice cheese and bread and some black olives. I love to stuff my chicken breasts with provolone cheese and prosciutto cotto. I love prosciutto wrapped melon slices!